Sparkling white snowdrifts, beautiful presents wrapped in ribbons, and multicolored lights glittering in the night through the falling snow. A Christmas Eve snowstorm transforms one small town into a romantic haven, the kind you see only in movies. Well, kinda. After all, a cold and wet hike from a stranded train through the middle of nowhere would not normally end with a delicious kiss from a charming stranger. And no one would think that a trip to the Waffle House through four feet of snow would lead to love with an old friend. Or that the way back to true love begins with a painfully early morning shift at Starbucks. Thanks to three of today’s bestselling teen authors–John Green, Maureen Johnson, and Lauren Myracle–the magic of the holidays shines on these hilarious and charming interconnected tales of love, romance, and breathtaking kisses. The Philippines celebrates the longest Christmas season ever, with Christmas unofficially starting once the -ber months come along, and all the way to mid-January, as indicated in the Catholic Church’s Liturgical Calendar. I think it’s because we just really like celebrating Christmas here — and that’s also why I am posting this review weeks after Christmas season is over (but really, I was just too busy so I only got to write this review now). 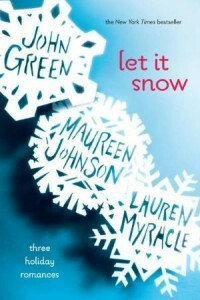 I’ve been meaning to read Let It Snow for a while now, but every time I intended to get it, it was always out of stock. 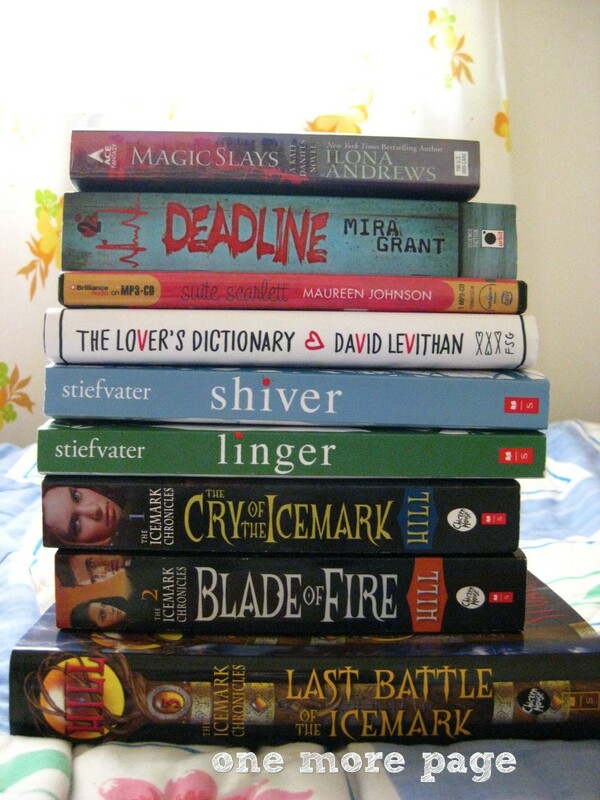 When the new version was released, I got my copy, and told myself I’ll make it my holiday read for 2012. 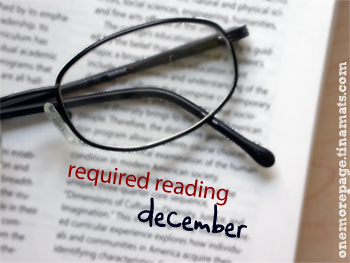 I mean, when is the perfect time to read this but you know, Christmas? 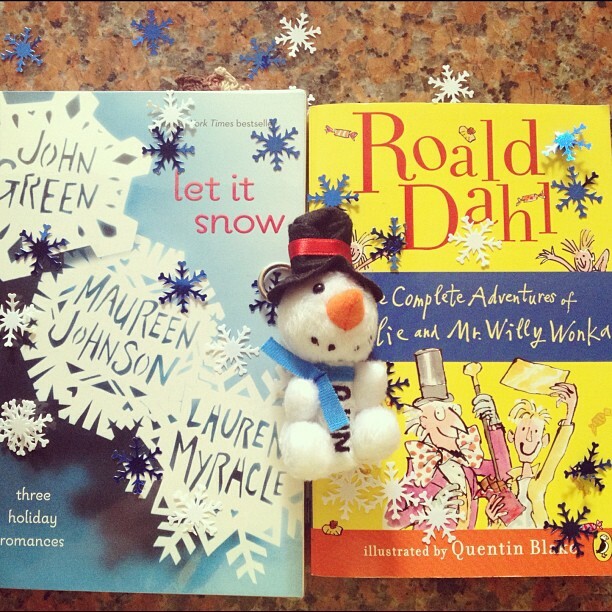 Let It Snow is a book with three holiday romances, with each story intersecting a little bit with the next. The first story, The Jubilee Express by Maureen Johnson, had main character Jubilee in a train on her way to her grandparents in Florida after her parents were jailed for a Flobie Village Convention riot. The train was traveling in the middle of a snowstorm which causes them to stop and get stranded in Gracetown, where she meets Stuart who gives her a home for the night. In John Green’s A Cheertastic Christmas Miracle, Tobin, the Duke and JP were summoned from Tobin’s house where they were happily watching movies from Tobin’s dvd rack to a race to the Waffle House in the middle of a snowstorm, and it involved a game of Twister, lots of snow, twins and lots of running to get to the finish line. And finally, we meet Addie in The Patron Saint of Pigs by Lauren Myracle, who’s deep in her own drama on Christmas after she gets ditched by her ex-boyfriend on their make-up date. When her friends called her self-absorbed, she tries to prove them wrong by volunteering to pick up a teacup-sized pig for her best friend, which led to meeting the person responsible for her break-up, a pig buyer, as well as Jubilee and Tobin, where it all goes down in Gracetown’s local Starbucks. Let It Snow was fun, if only because of the romantic Christmas-y vibe. I’ve read/listened to just one Maureen Johnson and I liked it enough, so I was expecting to fairly enjoy her story in the book. I did, except maybe I didn’t really buy how fast Jubilee “fell”. And I couldn’t help but think of what happens next for them after the story. But it was fun, and I liked Jubilee and the quirkiness of the family and the good back story each character had. 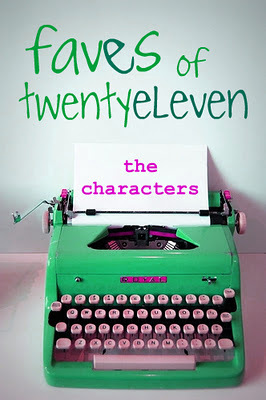 John Green’s story was the highlight of the book, with the most quotable lines in all. It gave me the warm fuzzies that I expected, and I loved the entire adventure in the snow at night, the craziness and the conversations and how it all unfolded in the end. I saw what would happen in the end way before I got there, but even if it was a bit predictable in that sense, I still liked how it all unfolded and it left me smiling for the “happy middles” when I finished it. I’ve never read any Lauren Myracle, so I have no benchmark for this story. 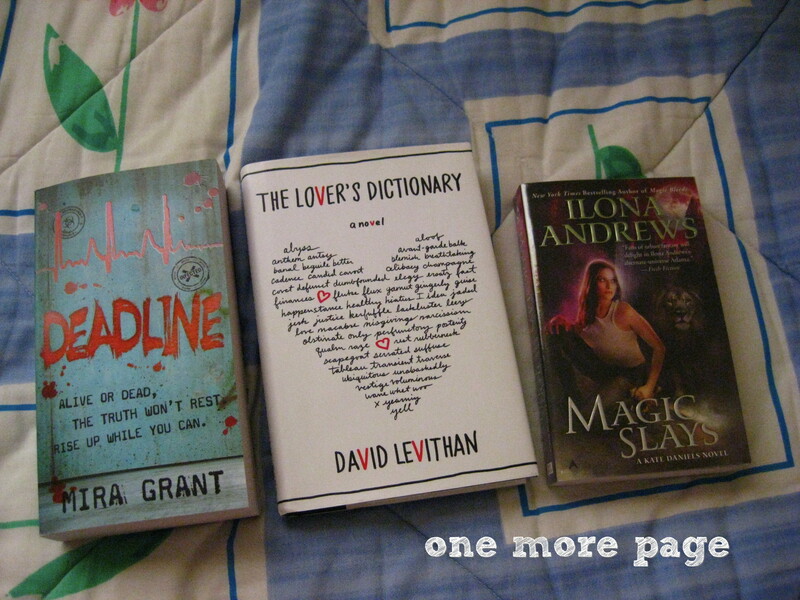 I liked it okay enough, although it didn’t have the same warm fuzzies that the first two stories had. I honestly felt sorry for Addie, but I also saw her friends’ points when they were talking to her. I liked it when the characters from the other stories finally showed up at the end, although I thought it fell a bit flat, like the characters from the other stories were not the same ones I’ve read earlier. The last story could have been stronger, I guess, or maybe it just paled in comparison because the first two stories were good. Scarlett Martin has grown up in a most unusual way. Her family owns the Hopewell, a small Art Deco hotel in the heart of New York City. When each of the Martins turns fifteen, they are expected to take over the care of a suite. For Scarlett’s fifteenth birthday, she gets both a room called the Empire Suite and a permanent guest named Mrs. Amberson. Scarlett doesn’t quite know what to make of this C-list starlet and world traveler. And when she meets Eric, an astonishingly gorgeous actor who has just moved to the city, her summer takes a second unexpected turn. Before the summer is over, Scarlett will have to survive a whirlwind of thievery and romantic missteps. But in the city where anything can happen, she just might be able to pull it off. 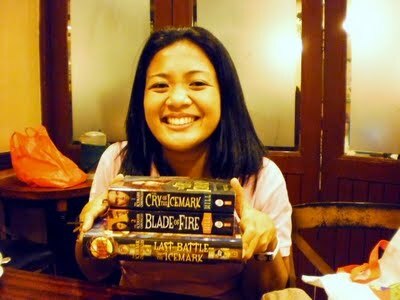 I’ve heard a lot about Maureen Johnson from YA contemporary circles, but somehow, I never really got around to getting her books. 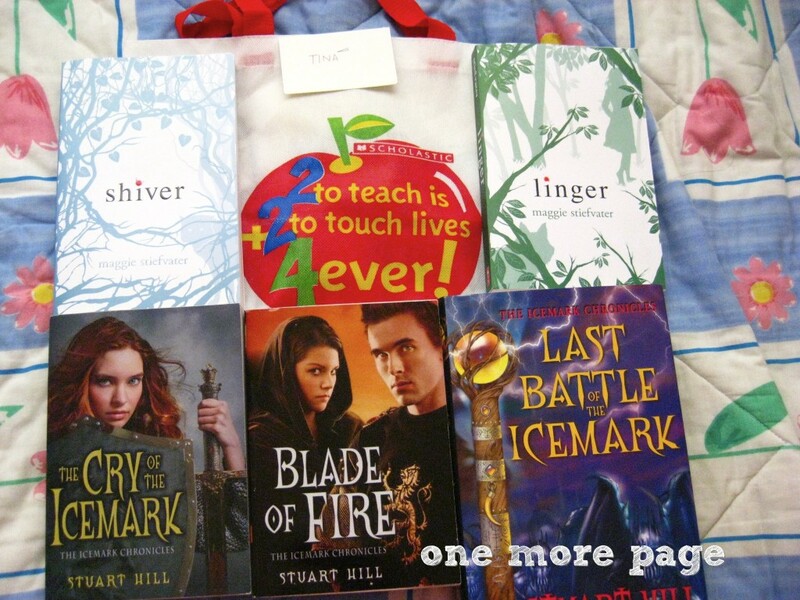 This almost feels like a sin for someone who loves contemporary YA as much as I do. 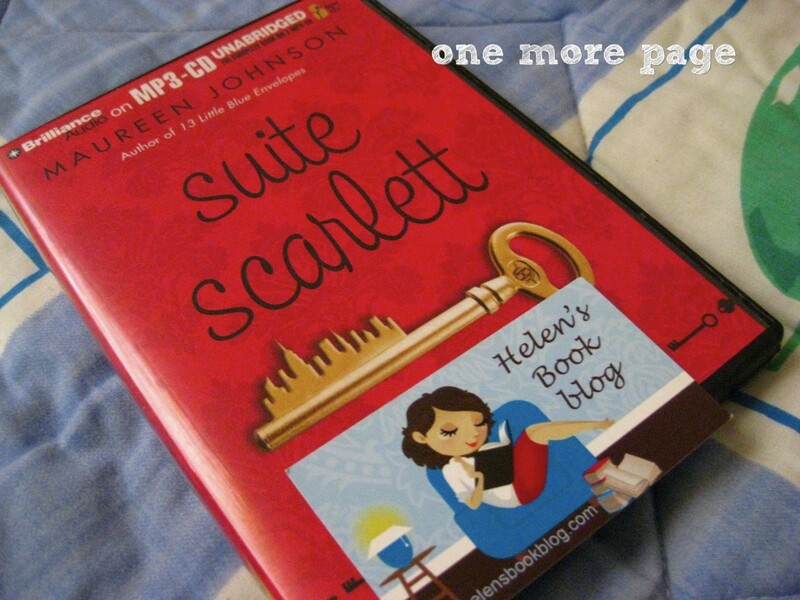 So at the back of my mind, I have this little to-buy list that includes one of Maureen Johnson’s books in case I wanted to splurge on something, but winning a giveaway during Armchair BEA saved me from spending and instead, I got an audiobook of Suite Scarlett, which some of my blogger friends recommend. Scarlett Martin has just turned 15, and as with her older siblings Spencer and Lola, she was given the Empire Suite in Hopewell Hotel, their family business, to take care of. This is a great honor, however, business isn’t exactly as booming as it was before in the Hopewell, so Scarlett’s dreams of getting a summer job was put on hold since she had to help out at home. Things turn interesting, though, when rich, world-traveler and theater actress Mrs. Amy Amberson comes along and rents the Empire Suite. Pretty soon, Scarlett becomes her personal assistant and a part of some harebrained schemes that involve directing and producing a play (with crazy antics that may or may not involve a chromatic tuner), conning a nemesis, and a possible summer romance. Like everyone I know who’s read this, my favorite part of this book is the sibling relationship of Scarlett and Spencer. I love brother-sister relationships because I can relate to it so much. Scarlett and Spencer remind me of my own relationship with my older brother. They’re probably closer, of course, but their banter and their instinct to help each other is ingrained in every brother-sister relationship out there, I think. I liked how Spencer can tell things just by looking at his sister and how he has this instinct to protect her even from his friend. I also liked the other two Martins, even if I saw them as the “enemies” at the start of the book because they’re at odds with the brother-sister tandem. The story isn’t really that monumental, but it has enough elements to make it just the right amount of crazy. I don’t think people will actually get into as much chaos as Scarlett did in her summer, but the setting helped in making it believable. I bet if this story was set outside of NYC or in anything other than Hopewell, I wouldn’t have accepted the craziness as easily as I did here. 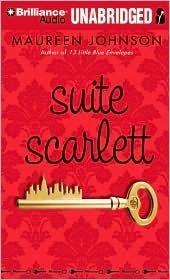 Suite Scarlett makes me want to go to New York City (not that I haven’t wanted to go there for the past years now) and go to the places described in the book.